The FIAT® 500 Lounge makes style look effortless. It’s all about classic comfort and exquisite taste, from the leather-faced seats to the panoramic glass roof. Standard features also include a 7-inch customizable in-cluster display, leather-wrapped steering wheel, and Blue&MeTM hands-free communication8 with Bluetooth® streaming audio. The beauty of the FIAT® 500 is more than skin deep. Interior features include a striking colour-coordinated dash and an intuitively designed instrument panel with a new available 7-inch customizable in-cluster display. Accessories from pedal kits to trunk organizers let you create a unique, customized interior. A modern reinvention of a timeless classic, the FIAT® 500 turns heads at every stoplight for its unmistakable European style. Loaded with personality, its unique fascias, bold, brilliant colours, and graceful lines create a look that’s fun-loving and inviting. Inspired by classic design with cutting-edge execution, the available 7-inch customizable in-cluster display puts essential information front and centre – from the speedometer and tachometer to tire pressure and your current radio preset. The safest place for the driver’s hands is on the wheel. 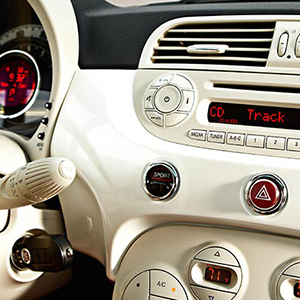 That’s why the FIAT® 500 comes with available Blue&MeTM hands-free communication8 with Bluetooth® streaming audio for control of the audio system and your phone. Available voice-activated TomTom® Navigation10 takes the same hands-off approach to keeping you on the right route to your destination. Bi-functional projector headlamps focus more light on objects in your path to help you see better – and their eye-catching “curve-around” styling helps ensure you’re more visible to oncoming drivers. The way fuel efficiency ratings are calculated for all makes of 2015 model year cars and light trucks has changed. The federal government has implemented a new 5-cycle test method to replace the 2-cycle method. It now takes into account air conditioner usage, cold temperature operation, and higher-speed driving with more rapid braking and acceleration for more realistic fuel efficiency numbers. While the new fuel efficiency ratings are lower, actual fuel efficiency has not changed – just the way it is calculated. The award-winning 1.4L MultiAir® I-4 engine in the FIAT® 500 features an electronically controlled hydraulic system that regulates the engine's intake valves to maximize efficiency with every stroke. The end result is 101 horsepower and exceptional fuel economy. The standard 5-speed manual transmission combines excellent shift quality with efficient performance. An available 6-speed automatic transmission with Auto/StickTM features both manual and automatic modes, offering automatic convenience or the complete control of manual shifting. Add a bit of excitement to your drive with a push of the Sport Button – steering feel, shift points and throttle response are automatically adjusted for a sportier, more responsive experience. eco:DriveTM is an ingenious way to improve your driving habits. Transfer data about your driving style from your FIAT® 500 to your computer. The free app analyzes that information and suggests ways to adjust the way you drive for better fuel efficiency and lower emissions (Blue&MeTM hands-free communication8 required). There are a total of 7 air bags6 packed into the FIAT® 500 – advanced multistage driver and front-passenger, driver’s knee blocker, side-curtain and supplemental front-seat-mounted side air bags – to ensure that you and your passengers are protected on all sides. Every FIAT® 500 comes with standard 4-wheel disc antilock brakes to help improve steering control and prevent wheel lockup in extreme braking situations. No matter where you go, the FIAT® 500 puts your safety first with advanced technology. Every 500 is equipped with Electronic Stability Control7, All-Speed Traction Control, Electronic Brake-Force Distribution and Hill Start Assist – advanced systems that apply selective braking and throttle control behind the scenes to help you get where you’re going confidently and safely. It's simple politeness to leave a light on for someone who's coming home late. The standard "Follow Me Home" function keeps the headlamps of your FIAT® 500 on when you leave the car so that you can see your way clearly to your door – for up to three and a half minutes. TAKE THE 2016 FIAT 500 LOUNGE FOR A SPIN!